Need a baby shower gift or have new babies to meet at the next family gathering? How about sewing for your local hospital's maternity floor? Most embrace any donations they receive. Check out these free directions to convert an ordinary hand towel or finger towel into a baby bib. No new mother ever has enough receiving blankets; maybe they would if they had time to do laundry but anyone who has had baby knows there are never enough hours in a day. We all know that one of the keys to preventing skin cancer is starting early. ​Sunbonnets do more than look cute; they protect a child's head, ears, and neck from sun damage. Make one to match every outfit! A simple hat for a boy or girl, with enough brim to protect their ears and neck from the sun. Make one to match every outfit or from novelty prints to make any child smile. Find full directions and a free pattern here. From Baby Blanket To Toddler Poncho! Need something to make for an older child. This may be perfect for the "big" sister or brother. Making clothes for babies is fun. 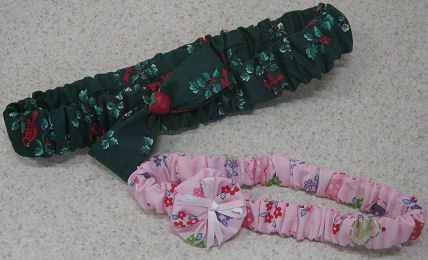 Now you can complete a baby girl's outfit with a matching fabric headband. Embellish the headband to make it even more special. Make a pile of headbands so the new mom has one for every outfit. This ball can use up your stash of scraps and keep a child happy for hours! The individual sections are perfect for small hands to manage ​to hold on to a ball. This may seem like a strange baby gift but when that first tooth becomes loose, the tooth fairy pillow is very appreciated... after all. all the other baby gifts are all used up. A teddy bear is a special gift for any child but especially wonderful for an older child who is adjusting to a new baby entering the picture. Craftsy.com offers this free pattern to create what is advertised as the perfect burp cloth... years ago we used cloth diapers to protect the mom... this looks like a much better idea! Make a pile of them so the new mom has a pile ready when she needs them. This free PDF pattern creates an adorable little shoe for a little guy... and could easily be embellished to be a girly little shoe. Fabric choices make the shoe! Download this free PDF pattern to make basic pants. The pattern is offered in various sizes from 3 months to child's size 7/8. Experiment to add pockets and embellishments. Make an adorable 3 to 6 month sized skirt with pockets by downloading the free printable pattern and following the step by step tutorial. This free pattern creates ruffled bloomers in size 3 to 6 months with a link to changing the size is in the instructions. Step by step instructions are included. Every little girl will be adorable in this ruffled romper. Follow the great step by step instructions for the free pattern.